Mayor Jenny Durkan's plan was aimed at gaining support from business leaders, construction unions and others who have expressed outrage at a pricier tax supported by five council members. 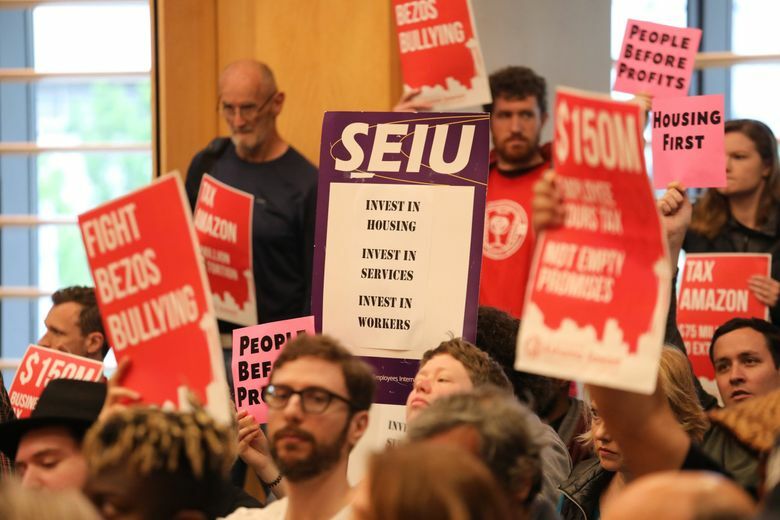 A split Seattle City Council voted Friday to send a $75-million-per-year tax on large employers to the full council, rejecting a smaller tax offered the night before by Mayor Jenny Durkan. The money would be used to address the city’s homelessness crisis. Durkan’s plan was a counter to the larger tax supported by five City Council members, which has been under consideration for weeks. She had four council backers. Council members took the votes — first rejecting the Durkan proposal, then approving the original plan — during a finance-committee meeting. Both tallies were 5-4. The full council could vote as early as Monday. A new law needs five votes to pass and six to override a mayoral veto. Durkan has signaled she would veto the plan. Friday’s action means city leaders likely will spend the weekend working on a deal capable of attracting at least six votes, or at least five votes and the mayor’s blessing. Seattle’s economy has boomed with help from Amazon and other tech companies. But as rents and home prices have risen, homelessness also has grown. The city’s shelters are packed, affordable housing is beyond scarce and a record 169 people died on the streets in King County last year. The proposed tax would be paid by about 600 companies — 3 percent of the city’s businesses. People in Seattle are “dying on the doorstep of prosperity” and the city must act boldly to assist them, Councilmember Teresa Mosqueda said before voting with the majority. The mayor’s proposal was aimed at gaining support from business leaders who have expressed outrage at the larger tax and from construction-worker unions worried about the tax slowing development. Amazon, which paused construction planning for an office tower over the larger proposal, was on board with the mayor’s plan, according to a representative from the Seattle Building Trades Union. Heading into the weekend, some business leaders remained frustrated. Jon Scholes, president of the Downtown Seattle Association, said any “tax on jobs” would be bad policy. “I don’t think anybody will look back on these three or four weeks in this city and say they’ve been good for our economic brand,” Scholes said. Councilmembers Lisa Herbold, M. Lorena González, O’Brien and Mosqueda are the sponsors of the larger proposal and have backing from colleague Kshama Sawant. Rather than impose the so-called head tax of about $500 per employee, per year on for-profit companies that gross at least $20 million per year in Seattle, Durkan’s proposal would have charged $250 per head. Council President Bruce Harrell and Councilmembers Sally Bagshaw, Rob Johnson and Debora Juarez supported the mayor’s plan, which Durkan said would have raised about $40 million per year. The mayor’s tax would have stayed unchanged for five years and then required a renewal. Under the plan that prevailed Friday, the head tax would switch to a 0.7 percent payroll tax in 2021. The competing political blocs have different ideas about how to spend money raised by a new tax, with the council majority more focused on affordable housing and Durkan more on emergency options. For a few minutes, it looked like the sponsors of the larger proposal were ready to alter their plan in search of a deal. They offered to scrap the payroll-tax transition and reduce the tax to $180 per head in 2024. Herbold even offered to reduce the tax to $350 per head from the start. 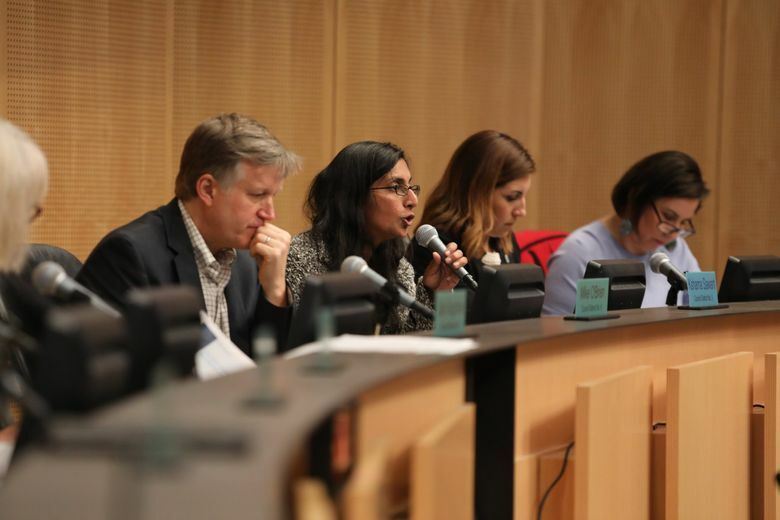 But a strange alliance defeated those overtures, which were seen by the council’s Durkan-allied bloc as not enough of a compromise and by Sawant as too much of one. “No Bezos-Durkan deal!” some people watching the council meeting chanted, referring to Amazon CEO Jeff Bezos. In a statement reacting to Friday’s action, the mayor again laid out her position. Asked about Durkan’s proposal, a Starbucks spokesman reiterated what the company’s public-affairs chief said Wednesday — that the city should reform its homelessness programs and show results before it seeks more money. King County Executive Dow Constantine on Thursday said Seattle’s head-tax push should be halted in favor of a regional approach. On Friday, U.S. Rep. Pramila Jayapal, D-Seattle, came out for a head tax, arguing Washington state’s tax system is regressive and has left the city with few options. Unions representing supermarket, hotel and home-health workers have backed the larger tax. The sponsors of the legislation that moved forward Friday say Seattle could, with their tax, boost spending on street services while producing more than 1,700 units of low-income housing over five years. Durkan and her allies would put more emphasis than the council majority on dealing with unauthorized encampments. In general, actual spending decisions are made when the mayor and council set the city budget each November. 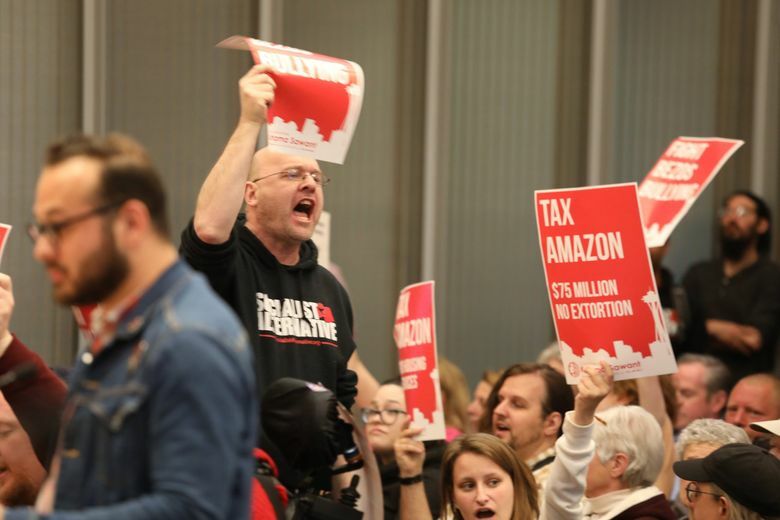 Seattle City Council members are proposing a ‘head tax’ to big employers, such as Amazon, to address the city’s housing-affordability crisis. Reporters Matt Day, Vianna Davila and Jessica Lee answer your questions in a Facebook Live. Staff reporters Vianna Davila, Jim Brunner and Benjamin Romano contributed to this report.